With most Anchorage area TV stations off the air due to an earthquake that hit the region, at least one station’s studio and newsroom has been damaged — but the station was able to pull itself together and provide limited rolling coverage even as viewers watched. 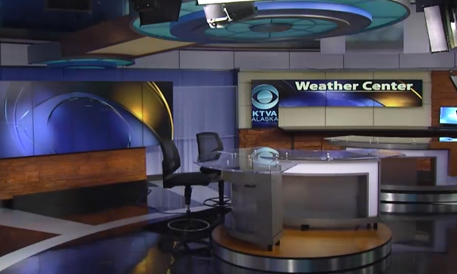 KTVA, Anchorage’s CBS affiliate, installed a combined newsroom and set from Devlin Design Group in 2013. The update was part of an extensive renovation that may have given the station a key advantage when the quake struck: It had the advantage of updated infrastructure. 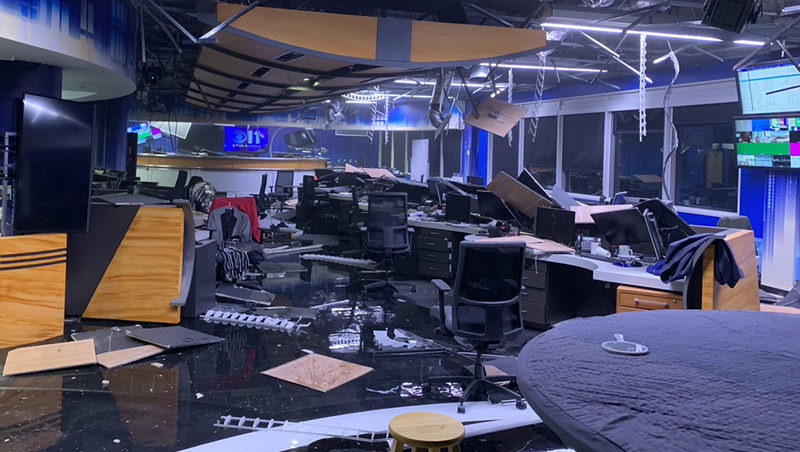 Reporter Cassie Schirm tweeted a photo of the station’s newsroom, which appears to have undergone significant damage — but is at least partially usable. From the image, it appears the building’s electrical and HVAC systems have been damaged — with broken ceiling tiles, wiring, pieces of the newsroom task lighting and air ducts visible. KTVA, meanwhile, was relying on a backup generator to power its newsroom and studio while also broadcasting live on Facebook and via the statewide “907” channel. During ongoing live coverage, the station reported that the floor above the studio and newsroom looked like a “war zone” whereas the newsroom and studio were declared safe to use. The station also reported that the newsroom sustained water damage from a broken pipe and that the glass dividers surrounding editing bays were damaged. KTVA did manage to get its livestream back online with a handheld camera. Morning meteorologist Jeremy LaGoo was handling coverage along with anchor John Thompson using makeshift microphone setups. In the background, staffers could be seen inspecting the damage and preparing the studio to go back online — albeit in phases. The station eventually got its normal camera setup back up even as chief meteorologist Melissa Frey could be seen working in the background working to prepare graphics. Frey would eventually join LaGoo on the station’s coverage. Coverage continued from the station’s weather center, which, rather impressively given the circumstances, had its video ribbon on despite darkened on-set monitors throughout the set. The station eventually was able to pull up a subtly animated fullscreen map showing the primary earthquake and aftershocks, which it kept up on air extensively as rolling coverage continued.